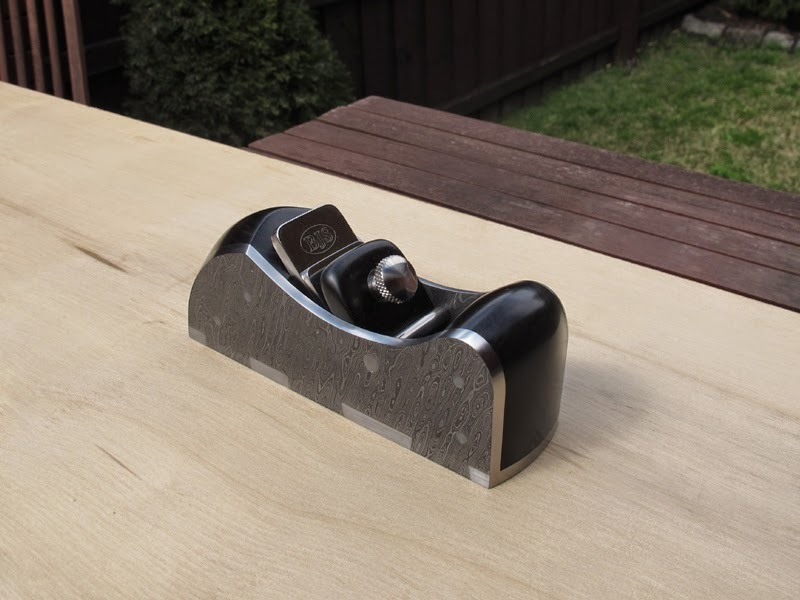 My latest plane is all about the challenge of trying out a new material, and I thought that Damascus steel would work nicely with my low-slung smoother design. As soon as you lap Damascus steel the pattern disappears, so you have to etch it with ferric acid to bring out the pattern again. I knew this job was going to be better handled by my wife, the “mad scientist”. We did a bit of internet research regarding the etching process and a little experimenting on a few off-cuts. I always lap the insides of my planes before assembly, so acid etching the inside was a good warm up. Here is a couple of photos of me doing the final fit of the ebony infills. I used two of my low-slung smoothers from my original set. After the infills are in and all the cross pins are drilled and peened, it is time to lap the outside up to 600 grit. Now it’s time for the final acid etching to the outside of the plane. I was definitely less nervous about how the etching was going to turn out because my wife had perfected her process and did a great job on the inside. Here is a photo of the pattern reappearing under the ferric acid. Under the acid you can see the dovetails and cross pins clearly. When the acid is removed however the cross pins and dovetails turn a dull grey. I wanted the dovetails to be more visible, even from a distance, so I decided to make a quick sanding tool out of some scrap aluminium (or aluminum) and meticulously sanded each dovetail. The finished plane turned out better than I imagined. I picked Damascus steel with a pattern that was leaning forward to give the feeling of forward momentum. If you would like a more detailed description of acid etching an infill plane, check out Konrad Sauer’s blog – Etching pattern welded steel - Damascus. I would also like to mention Brian Buckner. I am pretty sure that he was the first plane maker to use Damascus steel. Both Brian and Konrad’s Damascus steel planes were a huge source of inspiration. Also, feel free to contact me if anyone has any questions regarding plane making using Damascus steel. Here are a few more photos.